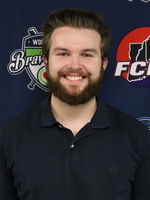 Jeff Gaucher returns to the Bravehearts after working with the team during the 2015 and 2016 seasons on the grounds crew. He is a 2017 graduate of the Isenberg School of Management at UMass-Amherst with a degree in Sport Management. At UMass, he was the Associate Director of Sponsorship and Marketing for the prestigious Pioneer Valley Tip-Off and a Campus Ambassador for Coke Zero. Between stints with the Bravehearts, he also interned at the New England Sports Network (NESN) and worked at the Better Business Bureau - Boston.